What are some of the potential health benefits you will gain when you adopt a properly planned Vegan, plant-based or powered diet? Dinner plates with a rainbow of colors and deliciousness! If you are interested in incorporating more veggies into your diet or going Vegan all the way, good idea! However you should take some care, do some preparation and research. That’s where Vegan Lifestyle Coaches come in (like me!). There are also many wonderful books and resources available now. I have watched several talks by the Vegan RD, Ginny Messina, who co-wrote the books Vegan for Her and Vegan for Life. She is a lovely women dedicated not only to helping people stay healthy and enjoying the numerous benefits of plant-based lifestyles but also living compassionate and environmentally friendly lifestyles. I really like the Plant Plate below. It’s clear and simple, easy to follow and just feels right to me. This plate was originally published in the book Vegan For Her (which is a great book, by the way). Unlike the traditional USDA Plant Plate that is confusing, misleading and I believe, just plain wrong (and they keep changing it, they can’t really know what they are doing!). I do my best to follow this plate daily. I have a printed copy that I keep on my refrigerator and am reminded of what I need and what I am missing daily. The hardest thing to get?? Enough greens…. But, I am trying! This plate introduces us to the 5 fabulous Vegan Food Groups. They are; Beans aka Legumes (soy, veggie burgers, peanut butter and quinoa fits in here as well), Grains and Starches, Vegetables, Fruits, and Nuts and Seeds. It also gives the corresponding serving amounts. 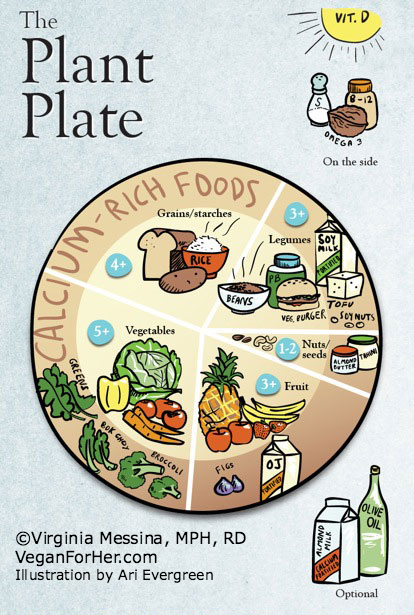 The important messages to take from this plate, Obviously, EAT MORE VEGGIES (AND BEANS)!! If you follow this plant plate and eat a variety of colored veggies you will make you body very happy and on the road to great health! 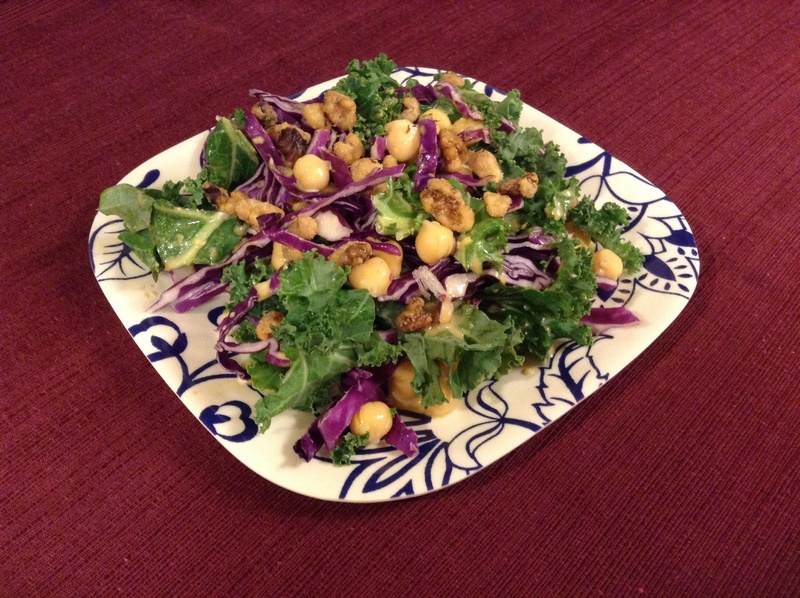 You could do a lot of experimentation and variations / additions with this salad. I think the thing that makes it the most delicious is the dressing. I will continue, on this blog, to help you with ideas for meals that meet this plate’s requirements. And finally… another fun and pretty quick recipe. This last summer I discovered the amazing world of what I will call green wraps! The outer wrap portion can include; lettuce, collards, any green veggies that can be loaded with vegetable/bean salads or other veggies to make delicious and incredibly healthy dishes. 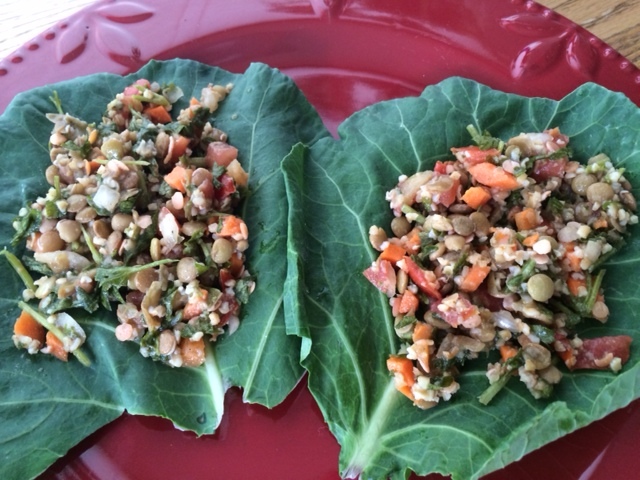 Below is a nice lentil salad that I wrapped in Collard greens from the Farmer’s Market. It was so light, refreshing and absolutely delicious! This entry was tagged Collard greens, Kale, nutrition, plant based nutrition, Standard American Diet, vegan, vegan recipes. Bookmark the permalink.